Partner Challenges have become the norm in recent Challenge seasons, and every so often we see a person choke so badly that they end the game for their team. These are some of the people who did this, despite the fact that they may get an A for effort. On this list, I am excluding people who refused to compete or were forced to leave, because they didn’t even try. Despite the fact that they’re now in Exile, Nany is definitely responsible for losing The Dome. Her partner Bananas never even got the chance to compete in The Dome because Nany couldn’t finish her half. Despite the fact that Derrick is usually one of the best competitors, he made one terrible judgement call in Exile that cost himself and Diem the game: he decided to ditch the bags. Considering the fact that you’ll need your luggage to win, Derrick definitely made an awful call. Adam can be blamed for himself and CT losing the T-Bone Jungle on Rivals. Initially, he grabbed the wrong balls, and then he gassed out right around the end. This allowed Tyler and Bananas to grab a win. I still have to ask: did Alton really try here? He got worn out way too quickly for an elite Challenger, and to make matters worse this cost himself and Nany the game on Battle of the Seasons. Jasmine definitely tried in the Catch 22 Jungle on Rivals 2, I’ll give her that, but she was also the only person making mistakes that cost her and Theresa the game. While Evelyn may have been the sore loser here, Luke definitely didn’t do his part in this Exile. He was the only guy that relied on his partner to do the majority of the carrying of luggage. Ty was inches away from victory on Rivals 2, all he had to do was ring the bell. However, he stumbled and in those seconds his opponents Jordan and Marlon rung the bell and won. Poor Mandi, she was partners with Wes when he was the most reckless. On Fresh Meat 2 his rivalry with Kenny landed himself and Mandi in an Exile against Luke and Evelyn where Wes gassed out. 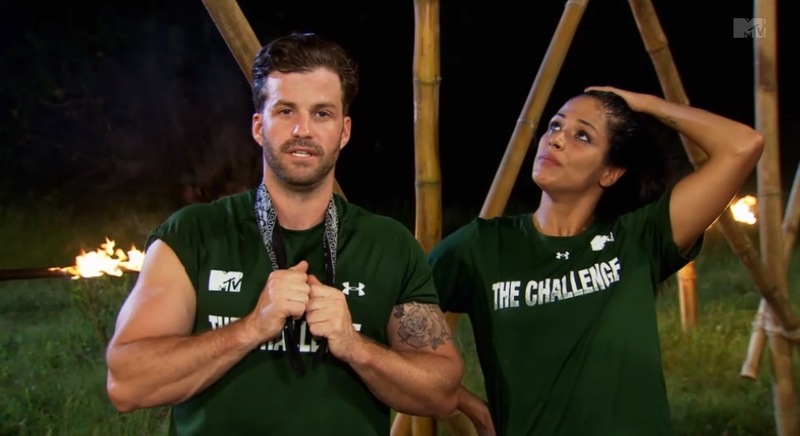 On Battle of the Exes his rivalry with Johnny Bananas and his allies landed him a spot in The Dome against Leroy and Naomi where Wes did all the losing and Mandi did all the winning. I thought about putting Zach on the list, but I truly believe his DQ was a mistake. While it was warranted, I don’t think it demonstrates a poor performance from Zach. Honestly I think he got DQ’d for hitting Frank with his helmet. You also forgot ‘Big Easy’ from Battle of the Seasons. When he quit the “Water Torture” Arena halfway through, he provoked Camila into one of her trademark volcanic eruptions. Even though I love Ev, I do feel that the loss in FM2 was at least shared if not more squarely on Ev’s shoulders. Ev made the decision not to complete the puzzle. Luke begged her to reconsider. Finishing the puzzle would have shaved minutes off of their completion time giving them the win. It looked to be the easiest puzzle, too. I hated this loss for Ev & Luke but it lay it on Luke doesn’t really seem fair. Derrick didn’t lose it for them on fresh meat, the weight they had to carry was close to their body weight. They would have lost anyways because they went up against Darrel & Aviv. Wes and Kenny in the rivals final ?!!! I would not put 100% blame on Ty for the loss between Leroy/Ty and Marlon/Jordan. Leroy let Jordan go in the elimination. Mark throwing the elimination to Johnny on exes because of their deal. If Sandy could of done better in the exile of Danny/Sandy and Jillian/Pete they could of won. Also the fact that most castmembers did not know you could carry their partners bags like Pete did was a big factor. What about Darrell and cara Marie. Cara was the top female during the training on fm2 and completely failed the exile. Imagine if Darrell won the ruins and went 5 for 5 heading into fresh meat 2 only to be sent home first thinking he was going to dominate again but fail at the first elimation. He would of been really mad. sort of, but also consider CJ lost to Zach as well. plus Jasmine is already on the list.